A few years ago we were on vacation when we stumbled upon a Le Creuset outlet store in Yemassee, SC. In addition to purchasing the mini-cocottes and soup crocks, I bought the mini-cocotte cookbook. I made one recipe and proceeded to misplace the book. I searched and searched with no luck. 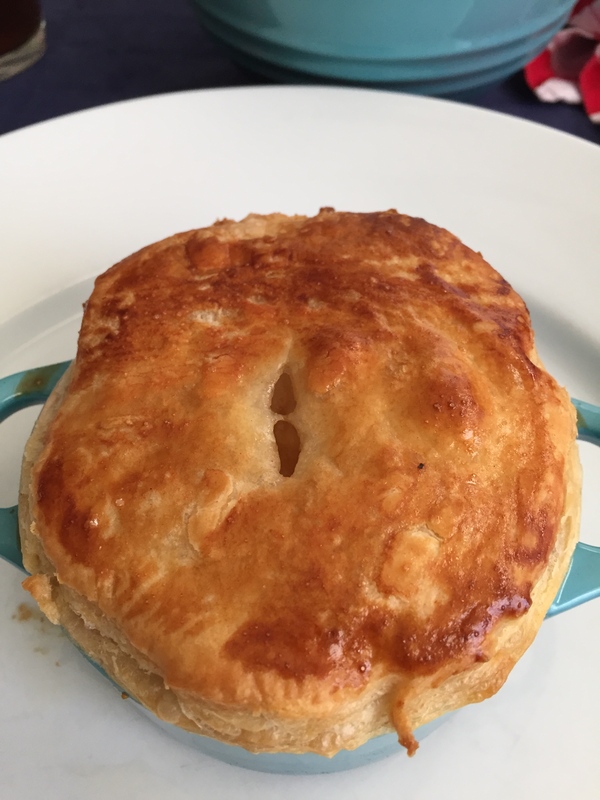 So when we passed through Yemassee recently we stopped and I bought another copy because there were so many things I wanted to make, including recipe 13 in the 52 Week New Recipe Challenge, chicken pot pies. This recipe uses one of my favorite ingredients, puff pastry, for the crust. I used bone-in chicken breasts because I think they are more flavorful. Certainly boneless, skinless could be substituted as could leftover turkey. Preparation time would be shorter too since they don’t take as long to cook. I used frozen pearl onions and peas. If you don’t like peas, you can certainly substitute another vegetable like asparagus. I you don’t have the mini cocottes, taller ramekins would work or you could put the mixture in an 8 x 8 baking dish and cut the puff pastry to fit. Bake time should be about the same or a smidgen longer, but only until the top is golden. Place the cocottes on a rimmed baking sheet to catch any filling that bubbles out. Trust me on this one, or you will have a mess in your oven. Place the chicken breast on a parchment paper lined baking sheet and baste with 1/4 stick of the softened butter. Season generously and bake for 30 – 40 minutes, depending on size. When the chicken is cooked through, cut into large chunks. Peel the carrots and cut them into small cubes. Peel the pearl onions (or, if using frozen, cutoff the stringy ends). In a small saucepan, bring the chicken broth or stock to a boil, then set aside. In a large casserole melt the remaining butter. Cook the pearl onions for 10 to 15 minutes slowly over a low flame, until they are translucent and caramelized. Add the flour and continue cooking for 2 more minutes, stirring continuously. Add the hot chicken stock/ broth and let simmer for 1 minute until the sauce begins to thicken and lose the taste of flour. Add the half and half, 1/2 teaspoon of salt and 1/2 teaspoon of ground pepper, the chunks of chicken, diced carrots, peas and parsley. Give it a good stir. Divide the mixture into 4 mini cocottes or ramekins. Cut 4 circles of puff pastry slightly larger than the mini cocottes. Moisten the edges of the cocottes with the egg yolk mixture. Place one circle on each filled cocotte, pressing down around the edges to seal the pastry circle. Cut a small hole or slit in the center to make a steam vent. Place the cocottes on a rimmed baking sheet to catch any filling that may (will) bubble out. With a pastry brush, coat the tops with the egg yolk mix. Bake for 15 to 20 minutes or until golden brown. Adapted from Le Creuset Mini-Cocotte cookbook. 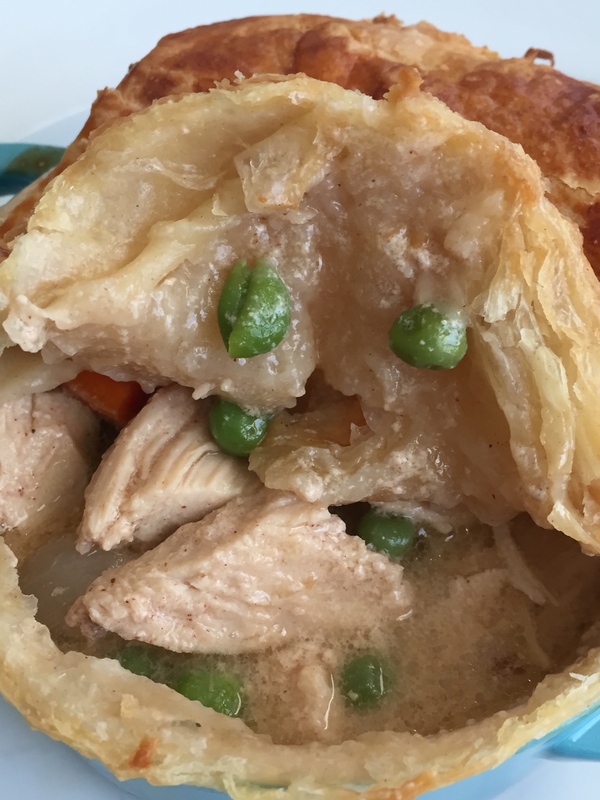 This entry was posted in 52 Week Challenge, Chicken, Comfort Food, Company Worthy, Entertaining, Entrees, Sunday Dinner and tagged carrots, chicken breasts, chicken broth, Chicken pot pie, pearl onions, peas, puff pastry, sunday supper movement. Bookmark the permalink.